Time: 9-noon. All events complete by noon. Check-in 8:30. ENTRY: Singles or Doubles. Enter and Pay for each tournament, each event separately. You may enter one, two, three or four of the tournament series. Enter one event per tournament. LUNCH: Lunch is provided at events. Menu Style: Aussie/French/British/NY. A "Diner's Special" entry is also available for non-player attendees (must comply with the Entry Deadline). DOUBLES PARTNER ? : Put Name on Entry if known; if not, TD will try to match you up. FEE MEMBER: $15 Singles, $15 Dbls each player, members. FEE NONMEMBER: $25 Singles, $25 Doubles each player, non-member. DRAW: May be capped at 40 players if necessary. Draw posted Wed/prior. POINTS: 1st Place: 200 pts toward year-end City Championship. F 100 pts. For an efficient tournament, please pay online; you may mail your entry fee. MATCH TIME: Check website on the Wed before the event date; emails will also be sent. Double Elimination or Round Robin (RXR) format may be used. Typically one regular scoring set per round, 1 set per round, 3-rounds. Typically all players play three sets plus possible tie-break playoff(s). Note in a RXR final tie-brake playoff of the top-2 if they have previously played during the RXR, that winner is therefore the overall Winner (The "Gavin-Rule"). SITE: Palo Alto's Rinconada Park and Hopkins Courts if needed. DIRECTIONS: Rinconada Park, 777 Embarcadero Rd, (Hopkins x Cedar), Palo Alto CA. WITHDRAWALS: Withdraw and receive full refund until Entry Deadline; notify TD before Entry Deadline. Late Withdrawal and notify TD, no refund. No-shows, no refund and not eligible for the next event. RAIN: Refunds will be offered; a reschedule will be attempted. AWARDS: Prizes. Year-end winners to appear on a 'perpetual' City Championship Series cup. SERIES: This event is part of the annual 4-part Palo Alto City Slam Series. ADDITIONAL INFO: Rainouts or rain delays will be handled in the best interest of the players. Civic sponsor: City of Palo Alto Community Services Dept. Have fun! Meet other players! Test your tennis skills! This tournament is a great intro to USTA tournaments. Play no-ad matches in round robin format. Singles & doubles offered. Prizes: Trophies to 1st and 2nd place players in each age group; drawing for prizes! Directions: From Embarcadero (from El Camino or off of 101), turn north on Newell; take first left on Hopkins. Registration will be at Court # 1 on the left side of the street, a block down (not the three unlighted courts). From http://www.norcal.usta.com/, (Tournament # 500038613) scroll to “JUNIORS” and “jr. 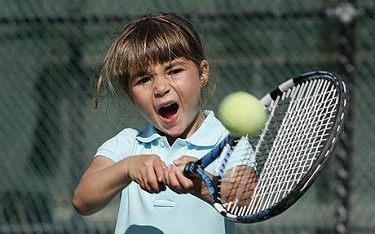 tournaments”, click on ”tournament schedules”. Click “2012 Complete Tournament Schedule”, click on July. 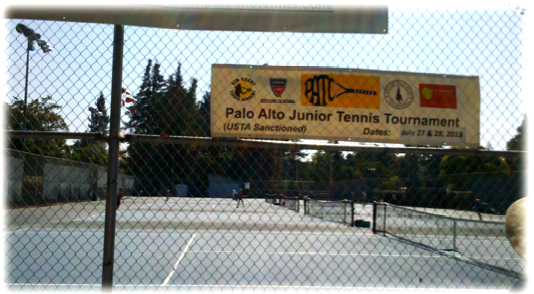 Scroll down until you find “Palo Alto Jr Novice” July 27-28. Click on the link and follow directions.